Extremely rare vintage Satyajit Ray movie poster of one of the finest films ever made in Bengali cinema, Jalsaghar (1958) for sale. Written and directed by master filmmaker Satyajit Ray, Jalsaghar is a Bengali drama that starred Chhabi Biswas in the lead role. Jalsaghar was master filmmaker Satyajit Ray’s first film to extensively incorporate classical Indian music and dancing. It is unanimously considered as the most evocative film ever made by Satyajit Ray. The film’s release in Europe and the US in the early 1960s turned it into both a critical as well as commercial hit and helped establish Satyajit Ray’s international reputation. 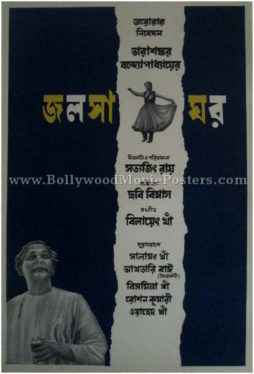 Jalsaghar won the 1959 National Film Award for Best Feature Film in Bengali. It is widely regarded as one of the greatest films of all time, making this rare Satyajit Ray movie poster highly collectible! Printed and circulated during the debut release of the film (somewhere in the late 1950s), this is one of the rarest Satyajit Ray film posters for sale that one can buy. Based on a popular short story written by Bengali writer Tarasankar Bandyopadhyay, Jalsaghar depicts the struggles of a landlord in upholding his family prestige when faced with economic adversity. in 2008, Jalsaghar was voted to the 20th position on the list of “100 Best Films” by the prominent French magazine, Cahiers du Cinema. The stellar worldwide success of the film led the Academy Film Archive to preserve it in 1996.